What is Multiple Organization technical architecture? before multi-org existed, we could have only one business group,set of books, legal entity, operating unit in one installation of oracle E-business suite, and now with the multi-organization structure in place, we can have multiple business groups, set of books, legal entity and operating unit and the best part is once these are set up inter company accounting is automatically taken care of, say for example i have Two inventory organization, and these use a common set of books(to start with) , now if we have sales order on one inventory organization A1 and if that item is not available in A1, and we have inventory for the item in Inventory org A2, we need to take the order in A1 as internal order and run the order import concurrent program and for the item in inventory A1(org assignment) we need to set up the source(purchase tab) as inventory organization A2,and also specify shipping network between A1 and A2, and once we have run the order import program and Oracle applications now imports the order to organization A2, with the ship to address as A1 location. and after you perform pick release and pick confirm process, and run auto invoice in A2, it automatically sends invoice to inventory organization A1 and now we can receive the item in Inventory organization A1 from organization A2. and all transactions are taken care of, courtesy multi organization structure. What are different period types ? What are the different types of files used in SQL Loader? 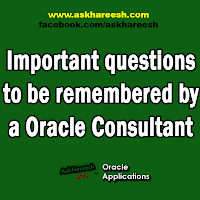 Oracle Revenue Accounting: Gives an organization timely and accurate revenue and flexible commissions reporting. A flex field is an Oracle Applications field made up of segments. Each segment has an assigned name and a set of valid values. Oracle Applications uses flex fields to capture information about your organization. There are two types of flex fields: key flex fields and descriptive flex fields.